A young woman stands despondently before a bust of Prime Minister Wilfrid Laurier. Between the two figures are assorted symbols of Canada, still a young nation, while the women’s stance — embracing the monument, head hanging low — simultaneously speaks of affection and sorrow. 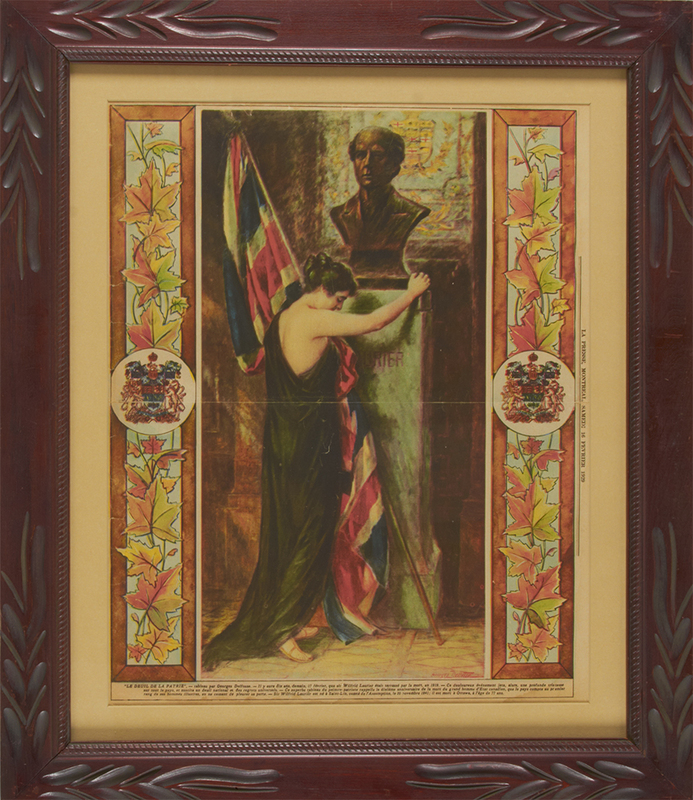 One day in 1929, readers of La Presse were greeted by this full-colour image, a high quality rotogravure reproduction of Montréal artist Georges Delfosse’s work Le Deuil de la Patrie, suitable for framing. Given Laurier’s immense popularity in Quebec, it’s likely this commemorative page made its way onto the walls of many La Presse readers. Contained in a nearly 1,000-piece collection of political memorabilia donated to the Canadian Museum of History by Senator Serge Joyal in 2015, the Delfosse illustration makes a powerful statement about Laurier’s enduring influence, particularly in French Canada. It’s unsurprising that La Presse would use Delfosse’s illustration to mark the death of Canada’s first French-speaking Prime Minister. What is surprising, however, is that it was published 10 years after Laurier’s death in 1919. Gélinas says this is evidence of a “cult of Laurier” that persisted well into the 1930s, fed by the memory of his charm and good looks, and an optimistic oratorical style that convinced both English- and French-speaking Canadians to accept his positive, forward-looking vision of the country. Even now, the Laurier “cult” lingers. When current Prime Minister Justin Trudeau assumed office, he evoked Laurier’s famous espousal of “sunny ways.” Laurier still stands for something that transcends his political record. Quebecers reading La Presse in 1929 likely longed for the age of Laurier in much the same way a later generation of Americans sought to recapture John F. Kennedy’s mythic age of “Camelot.” Although the 1920s brought prosperity to Canada, leaders like Robert Borden and William Lyon Mackenzie King were not imbued with Laurier’s inspirational, visionary quality.